Metal is a universal favourite when it comes to design. Practitioners of both art and architecture are known to use this versatile material as a preferred medium to express their creativity. In architectural design, wire mesh and perforated metal are used widely in a range of applications from facades, internal features and dividers to wall coverings and screens. Artists, on the other hand, use metal to create truly stunning sculptural works that can dominate a landscape. Italian artist Edoardo Tresoldi has experience in reconstructing ancient buildings out of woven metal. Last year, Mr Tresoldi recreated an early Christian church directly on top of its archaeological site in Siponto, Italy, completely out of woven metal. This full-scale structure was created above the original site of the Santa Maria Maggiore di Siponto Church, whose basilica was destroyed in the 13th century. Australian designers Stone & Milnehouse used Locker Group's transient wire meshes to bring an art installation to life on Conrad Road on the Ponds in Sydney. Named ‘Float’, this major installation explores the presence and absence of water in the landscape. 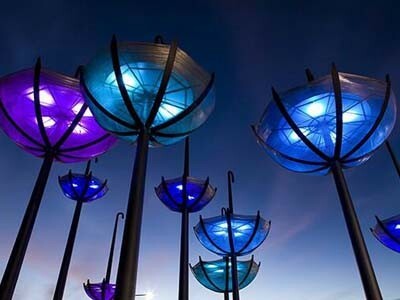 Locker Group worked closely with the designers to create this iconic artwork in the Pond's community, providing a focal point to the area with the soft billowing umbrellas. Designed to glow at night, the umbrellas change their colour with the season, thanks to the LED lighting that responds to the season and rainfall. ‘Under Magnitude’ is an imposing installation in the Orlando Convention Centre with the appearance of bleached coral. Designed by architect Marc Fornes and his studio The Very Many, and made from perforated aluminium, the installation features branching, tubular structures formed of 1mm thick strips, riveted together to create a piece that is strong enough to walk on. Over 4,600 strips were used to make this two-storey structure. Locker Group is passionate about applying their architectural wire, woven and perforated metal products in fascinating and unusual ways. Get in touch to bring your imagination to life in metal.